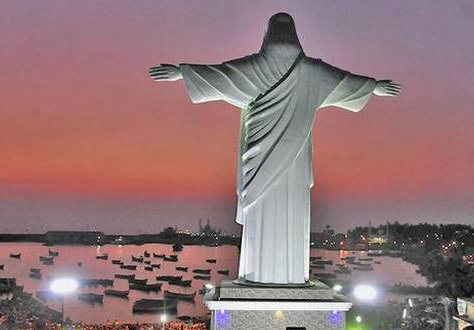 The Vizhinjam coast now features Christ the Redeemer statue similar to the one at Rio de Janeiro, Brazil. The statue conceptualized by the Latin Arch diocese of Trivandrum was blessed on 5th February 2017. The 33-ft tall statue has a total width of 33 ft is located facing the sea near Kottappuram St. Joseph Shrine, attached to the Our Lady Of Good Voyage Church, Vizhinjam. The 33 ft in width and height symbolizes the age of Jesus Christ at the time of crucifixion.